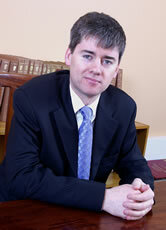 MATT SHAW was educated at St. Finian's College, Mullingar and University College Dublin (BCL). Matt was admitted to the Roll of Solicitors in 1994 having spent his training period in Edward A. Kelly & Co. Solicitors, now Kelly Caulfield Shaw. Matt became a partner in the firm in 1998. Matt's areas of special interest are residential and commercial Conveyancing commercial law, Arbitration law and Sports law, personal injury claims, civil and criminal Litigation including Family Law. Matt is also an Associate Member of the Chartered Institute of Arbitrators (2009). Matt's legal background overlaps with his sporting interests. Matt has had a life long involvement with the GAA, as a player with Lough Lene Gaels Hurling Club and as an administrator at club and county level and is now the Secretary of the Disputes Resolution Authority, having been appointed for a three year term at the GAA Congress in 2009. Matt is also an active GAA hurling referee in Westmeath.